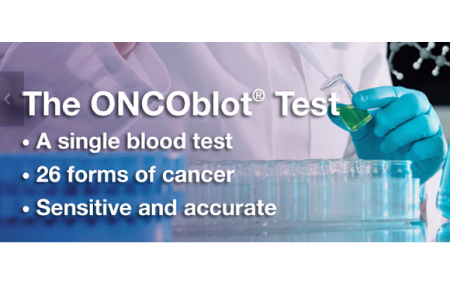 Blog ONCOBLOT test claims are incredible! ONCOBLOT test claims are incredible! I previously blogged about Elizabeth Holmes and Theranos a few weeks before they fell from grace. It seems that the startup-unicorn-distruptive Kool-Aide of Silicon Valley was mostly hype. 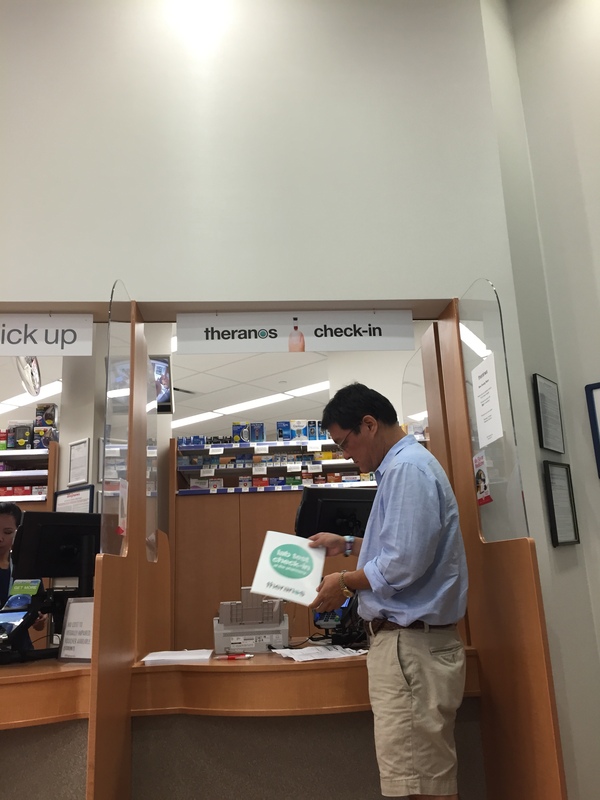 In other words, my pilgrimage to the Palo Alto Walgreens to get my “next gen” testing resulting not in a finger stick but a bunch of tubes and most of the tests were sent to a dinosaur lab as an outsourced job. Read here in this NYT article about the whistleblower at Theranos who revealed that the hype around Theranos that made Holmes billions was mostly hype. This weekend, at the Vegas A4M show, I interviewed a rep from ONCOblot, the company with a test that claims to have a dream assay for cancer. The reason this test would truly be a game-changer is that the false positive rate was only 1/1500 (0.06%); meaning only one test came back positive and subsequently negative. Barring the disappearance of the ‘cancerous’ cells as a possibility, that is still remarkable. The company claims that this test is only positive when you have at least 2 million cells, unlike the billions that are required to detect a clinical cancer. The false negative rate was also impressive at 10/1500 or 0.6% meaning if a clinical cancer was known to be present, 1490 out of 1500 times, the blood test for the ENOX2 protein verified it. As far as tissue specificity, they claim only 53/1500 (3.3%) misidentification of the matched protein to the specific cancerous organ, which is very accurate. You can read their preliminary results in this report. If this all proves to be true, it could be an amazing mixed blessing. We know that cancer is constantly being formed and dies or is destroyed so as long as folks aren’t being scared to death and given poisonous, carcinogenic chemotherapy to treat Stage 0 tumors, what would be the harm? I think the idea that we are always getting cancer and not CANCER throughout life is a hard one for people to understand but one that I blogged about regarding President Jimmy Carter‘s recent victory over Stage IV Melanoma. Interestingly, they did a study where 40/110 ONCOblot positive patients without detectable cancers were given a proprietary Green Tea and Capsacin nutriceutical and 94% of those converted to negative status within 3-6 months of treatment. Although it was not a randomized, placebo controlled trial, if we accept the premise that this test is what they say, then the take home lesson might be that green tea and capsacin might be good for all of us, especially those of us with known cancers. I had a positive Oncoblot test for breast cancer followed by a negative breast MRI w/ contrast and negative surgical pathology of a small palpable mass, left breast. So, now, is my surgeon supposed to do a mastectomy based upon a non-FDA approved blood test in the face of negative radiology and pathology findings? That’s the problem with this test…what to do now? The statistics cannot be extrapolated to the general population. Please be responsible and revise the wording in your article to reflect this information. Where to start? First of all, I don’t know how to assess the technology. If you assume they are correct, their use of apoptogenic concoctions would be considered unorthodox. I personally think that we are getting low levels of cancer and that these events are curable. So, this technology is something like “precognition” of crime in the movie “Minority Report”. It is very difficult for a doctor or a patient to manage this data and therefore, one must proceed with prudence and caution. My own case is my own case and instead of spending $4,000, I spend $280 and got the answer that for now, is satisfactory. Doctors are conservative but in the context of an unapproved but probably legitimate early screening test positive, all bets are off as to what “conservative” would mean. I cannot give you medical advice; but then again, no one else can in this scenario. You have to decide to not ignore it but then again don’t overreact to it. Drinking green tea and curcumin (as the ONCOBLOT protocol recommends and focusing on supporting a healthy immune system are good ideas. A repeat mammogram with needle localized biopsy as needed every six months would be reasonable but that is not to be construed as my medical advice to you specifically. Thanks for the comment. Where to start? Well, how about the current idea that the micro-environment of the tissue influences the expression of the putative oncogenes? Perhaps cancer cells are not terminally committed to the expression of the “cancer set” thus the green tea /curcumin extract altered the micro-environment directly and influenced gene expression away from the “cancer gene expression set” towards the “differentiated somatic gene set”. This would explain the observed phenomenon. I found this chapter very useful in understanding the issue of ENOX2. WE DO NOT KNOW the utility of this test in ambiguous cases. The risk of false attribution is high and will lead to unnecessary exploratory surgery, great mental suffering and very possibly, more harm than good. Let’s not forget the lesson of the “tumor marker” PSA (prostate specific antigen) – co-opted as a screening tool and abandoned after 30 years of maiming hundreds of thousands of men without any survival benefit for the treated population. subclinical cancer as a normal part of life is a paradigm that is only theoretically understood. It is likely that the majority of fires in hotels are put out by the people that start them and don’t actually trigger the sprinkler system and notify the fire department. I also took the Oncoblot (Enox2) test in 2016 and the results came back positive for breast cancer. After that I had a mammogram, thermography, MRI, C.E.A and CA 15-3 exams and they all came back normal. My best friend’s mother also took the Oncoblot test in 2016 and her results came back positive for breast cancer. She also had an MRI, mammogram, etc. and the results were all normal. This makes me wonder about the accuracy of the test. It is possible that the test is not as specific as they say and that the positive predictive value is limited. It is also possible and more likely that humans are constantly forming subclinical cancers and clearing them before conventional methods can detect them. The premise that any cancer will progress before self-destruction or immune destruction destroys them is why this test is a challenge and a potential danger. Don’t let anyone tell you that observations are not actions. An Oncoblot update: Repeat breast MRI with and without contrast on 3/21/17….still no breast cancer found. I had the Oncoblot drawn on 3/4/16 with subsequent diagnostic testing and surgery over the past year, all with negative findings. This entire time, I’ve maintained contact with the FDA reporting the results of each test/surgery. My contact at the FDA is Isaac Chang, Ph.D., Director, Division of Postmarket Surveillance. His email is Isaac.Chang@fda.hhs.gov, if anyone wishes to present their experience with the Oncoblot blood test. The monetary costs of the multiple tests is in the thousands of dollars. The cost of the mental anguish I’ve suffered over the past year has yet to be determined. Thank you for sharing your valuable experience. I believe a problem is that people think of cancer as rarity, like a four-alarm fire burning a hotel to the ground. In fact, low levels of what would be malignant cells in a less immune-competent host probably occur as evidenced by prostate cancer incidence/autopsy studies in men who die of other causes have shown. By analogy, the majority of fires in hotels do not bring the hotel down or even require fire trucks. It is probable that increased test sensitivity, even with specificity, results in detection of what would just have been a subclinical event. Increased and early detection presumes that an untreated small mass of cells will progress to a larger and lethal mass of cells. That is like saying every fire inside a hotel will burn down the hotel. It could, but 99% of fires in hotels are probably extinguished before a fire truck is summoned and are handled by a person, an extinguisher, or a sprinkler system. Just so, a small mass of cancer cells can burn themselves out, self-destruct, or be destroyed by immune surveillance. There is no way to easily change physician and patient reactions to the upper case “C-word” which is why it is a doubled-edged sword to welcome early detection; you are welcoming detection of many instances that might never even be noticed under normal conditions. Even the ONCOBLOT protocol involves things like green tea to promote apoptosis. If you prescribed green tea for an advanced stage cancer, you would lose your license. The problem may not be the test as much as our inability to wield the results given the many unknowns and tendency to oversimplify treatment. I am sorry that you have suffered from this path. It is likely that no cancer was detected by conventional methods because none survived your immune system or they remained too few to detect. It is also possible that the result was a false positive. I realize you are upset and I would be too. I am merely suggesting a possibility that you may not have fully considered yet. Oncoblot update: Repeat bilateral mammogram and ultrasound yesterday. All clear and negative. I’m 18 months out from my Oncoblot blood draw (blood drawn March 2016). So, when’s the cancer supposed to appear? Oncoblot Labs said I have breast cancer. The anxiety I face with each radiographic test is debilitating to say the least. The thing is that oncoblot detects cancers that may be so small that your body and the cells already took care of them. Cancer is not a runaway freight train in every instance. It may be an excessively early, not false alarm and you may have already cured that would-be cancer. Oncoblot update: Annual mammogram done 9/28/18. All clear/negative. My primary care physician opted to forego an ultrasound this year because the facility now has a 3D mammogram machine. It’s been 30 MONTHS since my blood was drawn for the Oncoblot test that stated I have ENOX2 proteins specific to breast cancer. All I want is a statement from MorNuCo Labs saying that the test was imperfect. I noted it’s not being sold anymore. I had a false negative with oncoblot for prostate cancer. When my gp got excited with me having a psa in the 2-3 range, I took the oncoblot and it found no evidence of cancer. About a 1.5 years later, I had a big jump in psa to 9 which led to a MRI (positive) and a MRI guided biopsy (over half the prostate was cancerous with a Gleason 3 plus 4 and intermediate level of aggressiveness). The urologist and Mayo said get rid of the prostate which I did. According to the oncoblot website, it should have detected the prostate cancer as it is slow growing and the psa showed evidence of the cancer at the time. So oncoblot caused me to delay treatment of the prostate cancer until the full prostate had to go. So maybe oncoblot shut down as lawsuits are being filed against them.